A lot has changed about Gwent since its early days as a fun, imbalanced minigame in The Witcher 3: Wild Hunt. The goal is still to win two out of three rounds by having the highest total card strength, but years of iteration in beta have changed the game drastically, molding it into something much more interesting and rewarding. Now officially out of its test period, Gwent proves itself a strong competitor in the card game field, offering lots options and strategies while also differentiating itself in exciting ways. Gwent matches play out like fantasy poker, as you take turns playing a single card from your hand to gain the advantage that round, mimicking the feeling of anteing up. Making the choice to take a loss in one round to win the next can be brutal; do you play one powerful card then fold, potentially forcing your opponent to play two cards and giving you a leg up next round? Or will they immediately destroy it next turn and get an easy win? Few matches are a done deal until the last card is down, and I regularly felt my heart pounding as I waited to see what my opponent played, even when I had a strong lead. One of Gwent’s biggest strengths is how you can curb the role of chance without making matches stale. Most decks are small, and you can see more than half your deck across three rounds. You also get a number of mulligans that let you optimize your hand every round. Though the right draw can still get you out of a pinch, bad luck rarely prevents you from playing to your deck’s strengths, which makes luck a fun variable rather than a crutch. 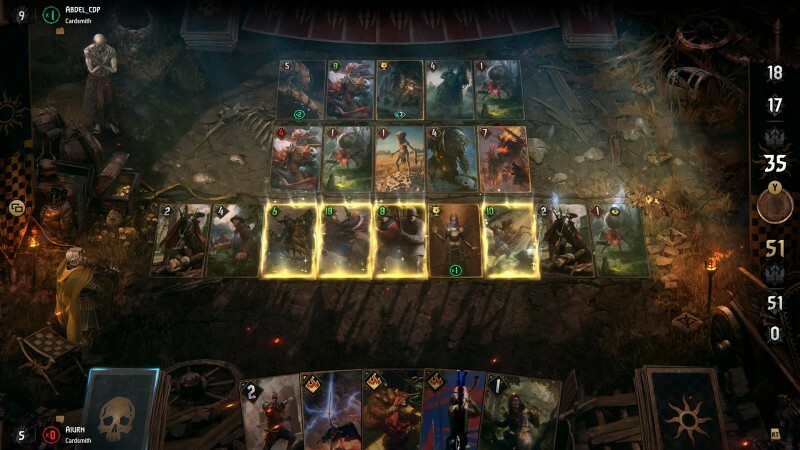 With its recent move out of beta, Gwent is more streamlined than it was at first (its three rows have been condensed to two), but still offers a lot variety in both decks and playstyles. Each of the five factions have various leaders who can drastically change how you play, like whether you use a monster-themed deck that sacrifices its own fighters to wreak havoc, or spam the battlefield with weak enemies you later boost into an unstoppable army. So far, only a couple of cards are indispensable across all decks. Taking inspiration from its roots in RPGs, Gwent also has a light progression system that ties into its microtransactions. Winning rounds, matches, and various achievements give you progress points, which you can spend in several faction-based trees to unlock small snippets of lore for each of the various faction leaders, as well as the various currencies needed to craft regular cards, their premium versions (which animate instead of displaying a picture), and card packs. Working my way through these trees, and being able to choose what rewards I’d get, made me more eager to keep playing. Most cards are cheap to craft, too, so while plenty of ads push you to spend money, I rarely felt like it would result in a significantly stronger deck. Unfortunately, the arena mode costs in-game currency (or real money) to play, which takes away from Gwent’s fun, casual feel.